After more than a year of conversations, in January 2018, ACAMIS took initial steps to create new ACAMIS Academic and Cultural Enrichment (ACE) activities in Robotics in addition to Math and Chess competitions. Tapping into the considerable expertise of two ACAMIS members, Barbara Boyer and Tim Boyer from Shanghai American School Pudong Campus, significant progress was made and in May a Robotics Planning Committee was formed to make all arrangements as soon as possible for the immediate launching of ACAMIS Robotics. 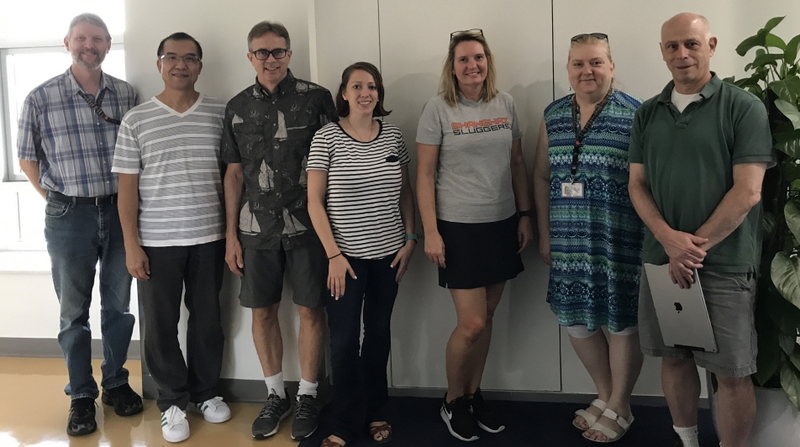 ACAMIS Robotics Planning Committee was created in 2018 to at the request of several ACAMIS member schools in the hope of adding robotics as an activity where it did not previously exist. Already present among a core group of member schools in Shanghai and two other cities, it became evident that an overview organization like ACAMIS would have the best chance for it to take on new life, expand with our organization, provide activities among similar schools, and be sustainable over time. To accomplish this, a team of robotics experts was needed to form the first planning committee. For classification purposes, as an ACAMIS Activity, robotics will be listing under Academic and Cultural Enrichment (ACE). To provide annual training and information, the Robotics Planning Committee will work closely with the Technology Planning Committee to create a Strand for robotics at the annual Technology Conference. I got excited about robotics 15 years ago when my husband Tim came home excited about a fun Lego Robotics competition that we could get our students excited about. Being a librarian, I was particularly thrilled to see an opportunity for students to be authentic researchers and inventors. I have been working with and organizing FLL teams for International Schools in China for the last 7 years. I am always amazed at what students learn and do. They inspire me! Tim is a Secondary Librarian at Shanghai American School (SAS). Tim’s background is in biological sciences and was a science teacher at the Middle and High School Level for many years before moving to the Library where he supports student research. For the last 7 years Tim has worked to support the FIRST Lego League at his school by coaching and leading teams and by supporting and judging FLL Tournaments by serving as the Head Referee for the FLL international schools in China. Tim is a member of the ACAMIS Robotics Planning Committee. Elizabeth Cooper is a Middle School STEM Teacher at NCPA in Nansha (part of Guangzhou, China). She has been teaching there for three years, and in that time has always been searching for new ways to use technology to enhance the learning experience for students in an authentic way. FIRST Lego League Robots has been a huge part of that. After participating as a child herself, it was a dream to become a coach in the United States and now in China. She is very excited to be a part of the Robotics Committee to help share this program with others in China. Larry is the MakerSpace Coordinator at Shanghai American School-Puxi. Larry has taught a wide range of math, science and engineering courses over the course of his career. He came to SAS after 25 years teaching in Alaska. He helped start FRC and FTC robotics programs throughout Alaska and helped set up an Engineering Academy at his school there. He is the advisor for the PXR FTC Robotics Club and has hosted China FIRST FTC Qualifying tournaments at SAS his three years here in China. Larry is a member of the ACAMIS Robotics Planning Committee. Lisa is the Middle School STEM Instructional Coach at Concordia International School Shanghai. Lisa’s background is in biological sciences and she has taught science at the high school and middle school level for many years. In addition to instructional coaching, Lisa currently teaches Maker Design, an elective course for middle school students and supports Concordia’s MakerSpaces. For the last three years Lisa has worked to support the FIRST Lego League at Concordia by coaching and leading teams, hosting tournaments and workshops and serving as a tournament judge. Lisa is a member of the ACAMIS Robotics Planning Committee. Jonathan Rachlin is the robotics coach at Daystar Academy in Beijing. Jonathan has spent most of his professional career as a software developer, mostly in finance, and later in the educational sphere. He has been involved with the FIRST LEGO League Robotics Competition for thirteen years, initially coaching a team of homeschoolers in New York. When he arrived in China almost ten years ago, he worked for LEGO Education, where he was responsible for starting both the International Schools FIRST LEGO League and China FIRST Tech Challenge competitions. In addition to coaching robotics, Jonathan is also the Middle School football coach at Daystar. He is still active as an educational software developer, currently writing software for learning math and Chinese. Jonathan is a member of the ACAMIS Robotics Committee. Danny teaches mathematics and robotics at Beijing World Youth Academy (BWYA). Danny’s background is in electrical engineering, major in communication. As a senior engineer, Danny has worked in the high-tech industry in Canada for over ten years, specializing in cellular telecommunication and was instrumental in designing Bell Mobility’s cellular network across Canada. Owing to his engineering background, Danny has taught many high school subjects including computer engineering, statistics, Physics, general science, technology, ITGS and mathematics. Currently, Danny is working on integrating robotics into the school’s curriculum via STEAM. Also, Danny is a member of the ACAMIS Robotics Planning Committee. In September, the committee arranged for training sessions for schools-students and coaches in Shanghai (EASTERN), Guangzhou (SOUTHERN) and Beijing (NORTHERN) regions. In October, a special strand of workshops for Robotics was successfully included in the ACAMIS Technology Conference with every session at maximum capacity. The ground work for student activities and collaborative support amongst the coaches were put in place. Already this year ACAMIS Robotics competitions have taken place in the Southern and Eastern Robotics Regions involving about 16 schools and another regional is planned for January 2019 in the Northern region in Beijing. The qualifying championship tournament will be held in Shanghai ICS in February. On December 1st, AISG hosted a wonderful robotics tournament for the Southern Region in Guangzhou. 23 teams participated from 8 different schools. In part as a result of the ACAMIS Technology Conference, many new schools joined us at this competition, while others came to observe in hopes of starting a team next year. Students from Guangzhou, Shenzhen, Donguan, and Macau came to celebrate all the hard work they had put in. Most teams experienced some failure as their robot did not do as well as when they had practiced at home, but they persevered and improved their scores throughout the day. From all of the judges at the competition, we were blown away by the innovation of the robots, attitudes of the students, and creativity in their research projects. We look forward to continuing to grow the Southern China region with more schools, including Hong Kong, next year!